On any given winter afternoon you’re likely to find Red Gerard in the backyard of home with his friends jibbing, sliding rails, hitting jumps and ripping laps on a hand-sculpted terrain park. Seventeen-year-old Red Gerard is a high-flying snowboarding phenom whose creative ability on rails and jumps makes him one of America’s favorites for Olympic glory in South Korea come February 2018. Gerard’s snowboarding fame began when he was knee-high. He wowed spectators worldwide as one of the youngest kids ever to stomp a double-cork. He even rode rails in ways that inspired professionals 10-years his senior. The country’s top snowboarders and freeskiers have rallied to Summit County this week to compete in halfpipe, slopestyle and big air – all Olympic qualifying events. Last month, Gerard took silver in the season opener of the Big Air World Cup season in Milan, Italy. Gerard finished right behind his pal Chris Corning. Corning, much like Gerard is a double-threat for big air and slopestyle gold at the PyeongChang 2018 Olympics. Last February, Gerard locked down the FIS World Cup slopestyle season title and won the first Olympic snowboarding U.S. qualification contest for slopestyle in California at Mammoth Mountain. This marked his first major victory on U.S. snow. 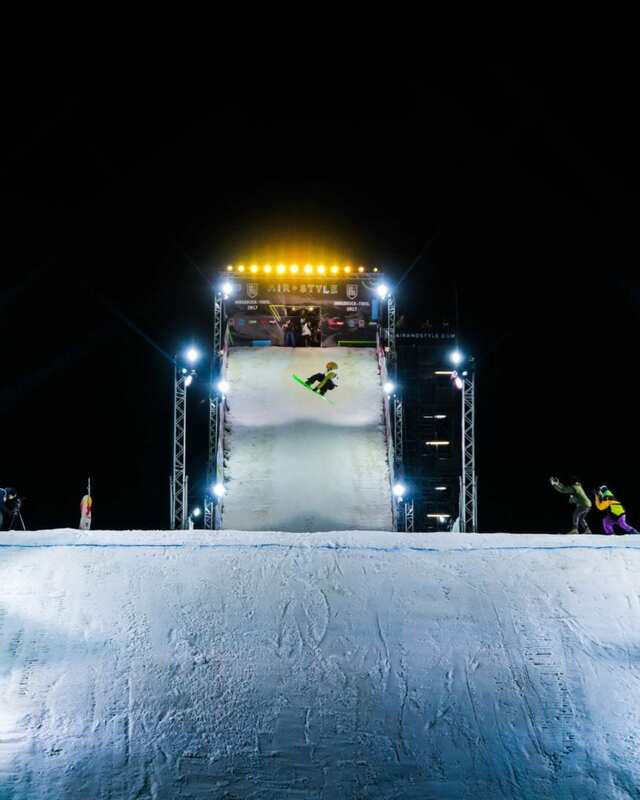 Slopestyle made its Olympic debut at the 2014 Sochi Games. It rolls snowboarders and skiers through rails, slides and jumps. Judges score this event on “overall impression,” which is based on criteria such as difficulty, amplitude, execution, variety and progression. Gerard is the youngest member of the 10-man U.S. Snowboarding Slopestyle Team that includes four teenagers. He is the second-youngest in his family, a bustling brood of seven kids spanning age 9 to 32. Gerard was eight when his family moved to Silverthorne. As soon as he arrived, he took to snowboarding with appetite; chasing his older siblings around the mountain. His brother Malachi is a professional photographer who began sharing clips of Gerard’s snowboarding to YouTube and ended up luring snowboarding titan Burton as a sponsor when Gerard was 10. His older brother Trevor, a gifted snowboarder in his own right, works for Snowboard Magazine. His sister Tieghan, 21, is a renowned food blogger whose Half Baked Harvest posts and recipe videos — filmed largely her brother Malachi — draw huge online audiences. Gerard’s parents – Jen and Conrad work for Tieghan, who lives and works in the family barn at the bottom of the backyard terrain park. A massive new barn is under construction where Tieghan plans to expand her surging cookbook, blogging and food photography empire. As the Olympics near and Gerard’s name reaches beyond the snowboarding tribe — where, since he was knee-high, he has been favored as the next boss — companies are calling. He has worked out deals with Comcast and Ice Breakers gum, which join his lucrative sponsorship contracts with Mountain Dew, Burton and more. We can’t wait to see what Red Gerard has in store for us this winter season! We are rooting for our local talent this week as he competes in the Breckenridge Winter Dew Tour.